Health • The signs must be posted by July 1 at bars, eateries and liquor stores, per state legislation. Pediatrician Susan Lewin was horrified to overhear a pregnant woman telling friends that she knew the dangers alcohol posed for her unborn child, but she was OK because she was only drinking beer. "Any amount of alcohol  including beer  can cause permanent brain damage and many other problems, and yet there are still people who do not know the risks," said Lewin, who also is a University of Utah geneticist. "If you think you're pregnant, don't drink, and if you have [been drinking]  stop immediately." 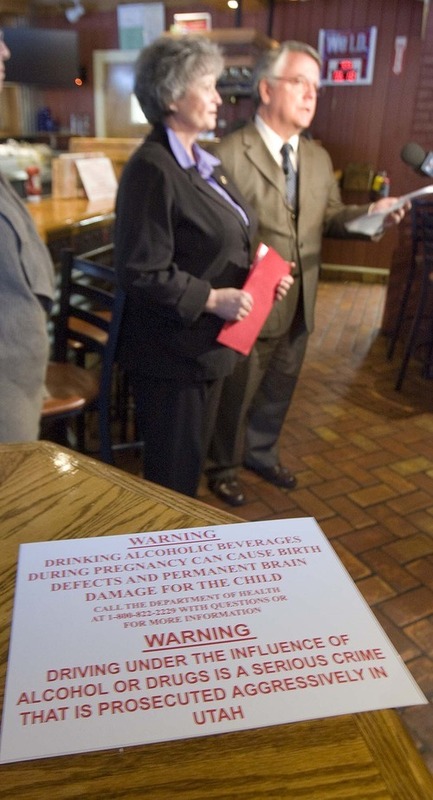 On Friday, officials unveiled signs posted at the Chili's restaurant in Salt Lake City warning pregnant women not to drink alcohol. The mandatory signs must be posted by July 1 at bars, eateries and state liquor outlets, under 2009 legislation sponsored by Rep. Ronda Menlove, R-Garland. "I've seen the effects of fetal alcohol syndrome," said Menlove, a special-education teacher. "It's tragic because this is 100 percent preventable." Utah joins 23 other states with mandatory warning signs. The U.S. government mandates warnings on all alcoholic beverage containers, but there are no federal regulations requiring retailers to post warnings about the risks of drinking during pregnancy. Each year, it's estimated that more than 40,000 U.S. babies  one in every 100 births  are born with fetal alcohol syndrome. Rates are higher than those of Down syndrome, cerebral palsy, cystic fibrosis, spina bifida and sudden infant death syndrome. For more information, call 1-800-822-2229, or visit http://www.PregnancyRiskLine.org.